CAN ANYBODY WRITE A GUIDE HOW TO CRACK Wonderware InduSoft Web Studio 8.0? Or access to the key generator. This site does not open anything even warrant will be translating that had a problem help me. can you produce for same site code an Engineering+Runtime with Advanced Server Plus execution mode ? Would can you create a site key with Engineering + Runtime + advanced plus? Please provide with a site key with Engineering + Runtime + advanced plus. I'm new in the forum. Few days ago, I lost my indusoft v7 hardkey license. I need to continue working. Can you help me out to get the site key? Hi. Can you get the license? Site code is as given below. Please provide system key for Development + Runtime IWS 7.1 SP2. Your kind support will be highly appreciated. can you help me for create a site key with Engineering + Runtime ? Could You help me to create a site key (engineering + runtime)? Thanks! Can You send me site key (engineering, runtime)? Can you send me the instructions for the crack or process please? pls help me to get Site key for Engineering + runtime. Please need site key for isw v7.1 sp9 windows 7. I am tried my time by using KeyGen -x64, after click Authorize, suddenly not responding and closed. Do u know the root cause why it happen? Kindly, pls help me to get Site key for Engineering + runtime for Advanced Server Plus. Never had issues with older versions. does anyone can provide the generator for IWS v7.1? 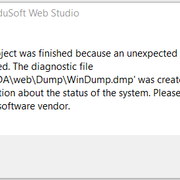 'C:\users\public\documents\wonderware Indusoft web studio v8.0 demo\pcdemo\web\dump\windump.dmp'was created with some information about the status of the system.please send this file to your software vendor. Could you Send me Site Key for Indusoft Web Studio v8.1? "xe.eeragan MioudStn\\Bi1\\8. vioudStb Wet ofuSnd\\Iesil Famgrro\\PC:"="AA0B1506A527E80D8D919F3094E717A85791F4DF500C9BDBF193793F099EC395 C2"
"xe.eeragan MioudStn\\Bi1\\8. vioudStb Wet ofuSnd\\I6)x8 (esil Famgrro\\PC:"="AA0B1506A527E80D8D919F3094E717A85791F4DF500C9BDBF193793F099EC395 C2"
I am doing exactly like the procedure, but it is not activating. When using the "unlock.bat" the Indusoft starts. It then displays failure and closes the window. Did I set up for nothing? How to activate Web Studio Runtime on HMI panel with Windows CE? No solution so far? A add registry crak , give me short instruktion, please. Please help me with site code.. I need a Developer + Runtime license with as much as many tags as possible. If someone can send me the Site Key via DM, i would be very grateful! Can you please provide site code, developer and runtime?